For some reason I thought that the stars had aligned, making today National Taco Day. I’m not sure how I got this in my head, but it turns out it’s actually this Friday, October 4. It’s been a long time since I’ve done a Taco Tuesday post. To make up for it, I’ve got an extra special one for you. This is my new favorite salsa and taco filling. Recipes follow. Last month when I was in Austin I ate at Tacodeli. I went to the one on Lamar, which looked like a fast casual chain, but it’s actually local with three locations. What’s cool is that everything is organic, right down to their coffee and soda fountain. The first location opened in 1999 and has received multiple best tacos in Austin awards. They also placed first in the Austin Hot Sauce Festival, and I found out why. The Salsa Dona was out of this world. 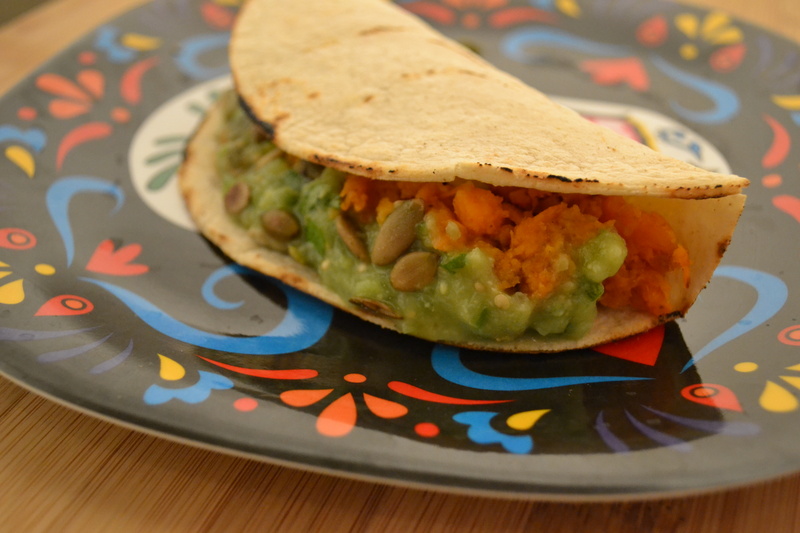 It reminded me of Taco Tote’s salsa aguacate (avocado), but way hotter and tastier. When we arrived, it was packed and I understood we would have to wait a bit, but they were cranking out orders fast and people that arrived after us were getting their food. After 30 minutes it turned out that they had misplaced our order, so they gave us complimentary chips and queso. About ten minutes later they called my name, but didn’t actually hand us our food. I inquired again, and now they accidentally made it to go, were going to fix it, and ended up setting it aside AGAIN! They finally gave us our food and guess what? A couple of the tacos were missing ingredients. Good grief. We didn’t say anything since we were starving from not having eaten in 24 hours (I’ll have to blog about that another time). Papadulce (left), The Heather (right). To go for here. So, how were the tacos? 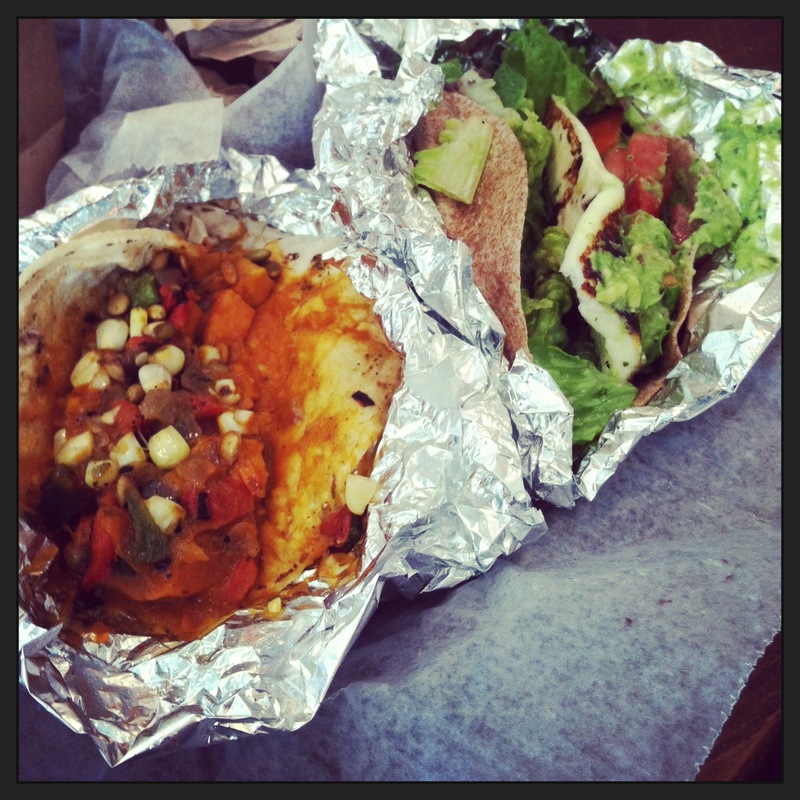 Tacodeli has 6 vegetarian tacos to choose from that range in cost from $2.95-3.50. I chose The Heather on whole wheat and Papadulce on corn. The Heather has grilled Mexican queso fresco, refried black beans, with guacamole, lettuce and tomato. It was okay. There were hardly any beans and I could hardly taste them. The grilled queso fresco grossed me out because it had an eggy texture. Papadulce has oven roasted sweet potatoes (camote), grilled corn, roasted peppers, caramelized onions, toasted pepitas & a chipotle camote sauce. This one was pretty tasty and is the inspiration behind the following recipe. So we scored some free breakfast taco coupons and a $5 gift card even though we told them we didn’t live there. And of course we never got the chance to use them during our visit. Fortunately, we stayed with some friends on our last day and gave them our freebies. Fresh Tortillas from Canutillo. 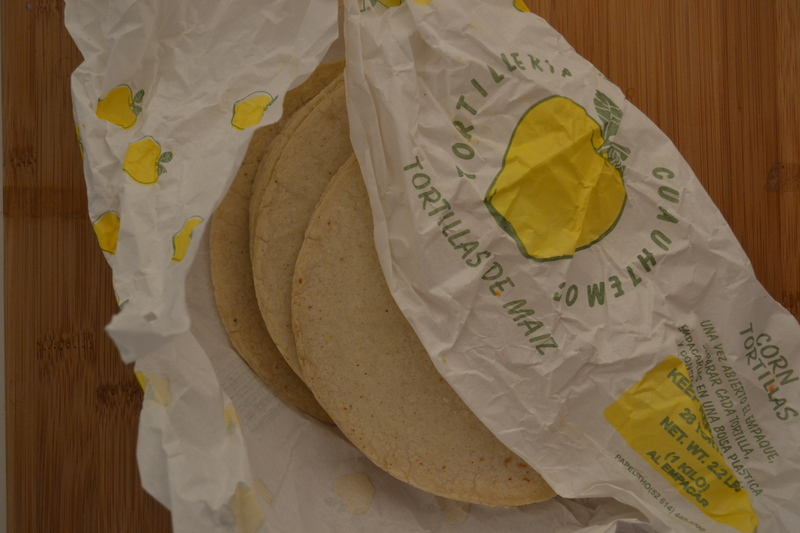 What do little yellow apples have to do with corn tortillas? Who knows, who cares, it’s cute! If you live in El Paso, you can find all of the ingredients in this recipe at Mando’s Produce on Doniphan, and it’ll cost you less than $10. Don’t forget to grab some fresh, warm tortillas from the coolers on the left side of the store as you walk in. Every time I visit Mando’s, I look through all the Goya products and debate purchasing one of the jarred Peruvian pepper pastes. Well, Lazy Smurf blogged about the aji amarillo paste during the Taco Cleanse, and that finally pushed me to go through with it. It’s an interesting flavor with some good heat. It pretty much tastes like pickled peppers pureed into an ultra smooth paste. Thanks Javier and Texas Monthly! This recipe was adapted from Texas Monthly. I quartered the recipe and added water to make it smoother, which made about a cup. Mince or grate the garlic. Place the garlic in a blender or processor, along with the tomatillos, serranos, a couple of pinches of salt, and onion. Blend, using short pulses. Set aside in a bowl. 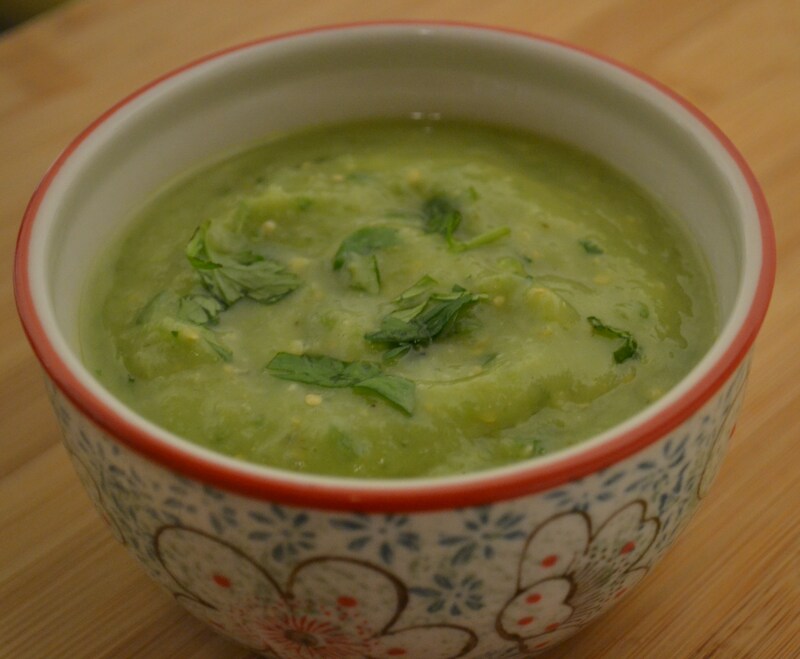 Add avocado to processor, along with small batches of the tomatillo salsa, the lime juice and water. Do not overprocess. Add more water if you want a thinner consistency. Place in a bowl, stir in cilantro and season with more salt if necessary. Makes enough filling for about 6 tacos, depending how much you stuff them. If you can’t find aji amarillo paste, just omit it or use canned chipotle in adobo sauce, chili powder, or chile powder. Heat about a tablespoon of oil in sauté pan (I used a nonstick wok). Add the onions and cook them for 5 minutes. Add the potatoes or yams and the remaining ingredients. Stir until evenly coated, and cook for another 10-15 minutes, stirring occasionally. Lower the heat or add a little water if the potatoes are drying out too much or getting burnt. If the potatoes still aren’t soft, cover and cook an additional 5-10 minutes. You want the potatoes to be very soft and caramelized. Season with salt and pepper if necessary. I thought the paste added enough seasoning, so I didn’t add any salt. Coarsely mash the potatoes and serve them in corn tortillas. Top with salsa and pepitas. I used roasted and salted pepitas. It’s up to you if you want to use raw or roasted. 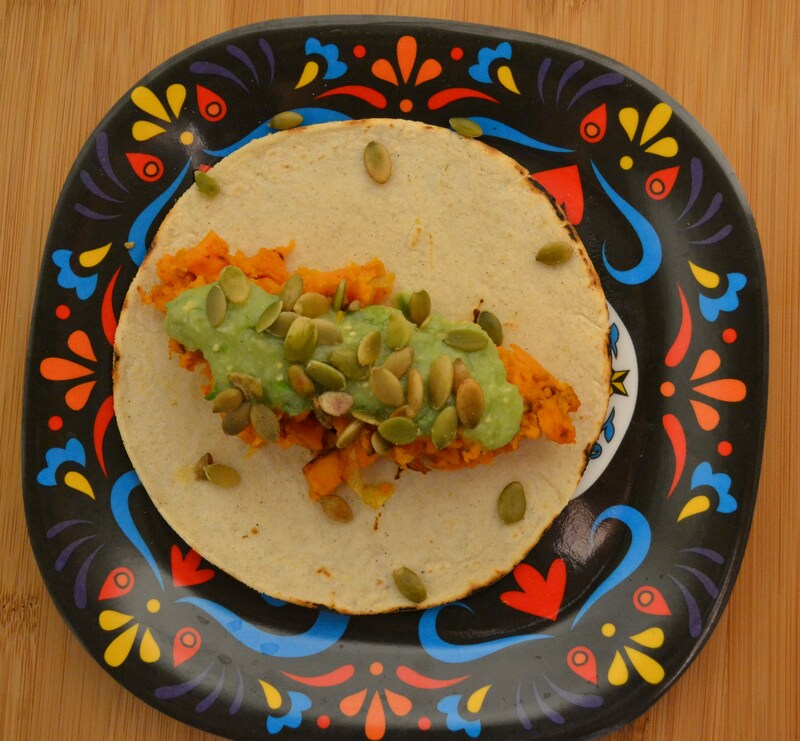 Next Happy National Taco Day 2013! That dona salsa is amazing. I think it’s just oil, roasted peppers, and garlic. © Lisa Martinez and EP Veg Snob, 2010. Unauthorized use and/or duplication of this material without express and written permission from this blog’s author is strictly prohibited. 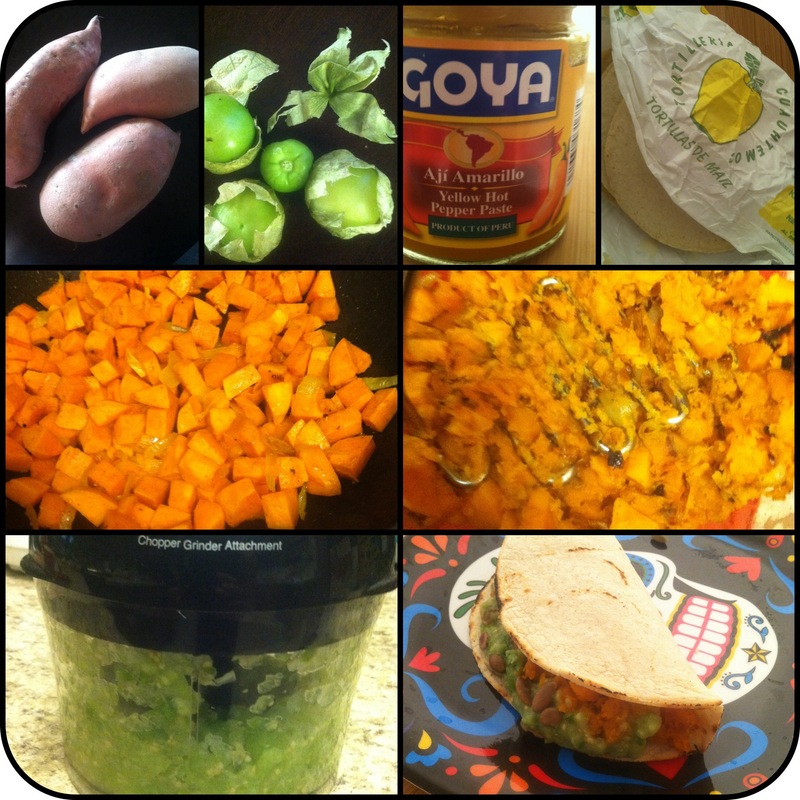 Excerpts and links may be used, provided that full and clear credit is given to Lisa Martinez and EP Veg Snob with appropriate and specific direction to the original content.